Some Harry Potter fans merely read the books and see the movies. For die-hards, that’s not enough. They express their devotion by writing Harry Potter fan fiction or forming wizard-themed rock bands. Some even play Quidditch. That would be the broom-riding, ball-tossing sport invented by the author of the Potter books, J.K. Rowling. “Muggle” Quidditch is full contact, and while there are rules against foul play like pushing from behind, the players hold nothing back. They careen into each other with surprising ferocity. During one match between crosstown rivals UCLA and USC, one player receives a nasty gash on his head that requires the attention of paramedics. There’s athleticism at work here, too. UCLA captain Tom Marks jokes that the International Quidditch Association (IQA) should seek duct tape as a sponsor. Most players’ brooms boast numerous wraps, the signs that they have cracked or even snapped during play. In the Harry Potter universe, Quidditch is played midair by participants who zoom about on broomsticks. Multiple enchanted balls fly around on their own. Since engineers haven’t yet perfected the technology behind flying household implements, adapting the sport required creativity. The result is a cross between rugby and dodgeball. Like in the books (and films and video games), a match is played by two teams of seven players each. Each team has three “chasers,” who toss around a “quaffle” (a volleyball), attempting to get it through the opposing team’s hoops to score points (10 points to a goal). A “keeper” protects the hoops. Two “beaters” throw the three “bludgers” (dodgeballs) at enemy players. A player struck with a bludger is out of play until they tag their team’s hoops. And while all this is going on, a “seeker” searches for “the golden snitch” (a tennis ball in a sock), which is tucked into the waistband of a neutral party. The person carrying the golden snitch is free to roam the entire campus while chasers search for him or her. The game ends when the snitch is caught, and the chaser who snags it earns 30 points for their team. And of course, there are the broomsticks. Just because they aren’t enchanted to fly doesn’t mean players can make do without them. 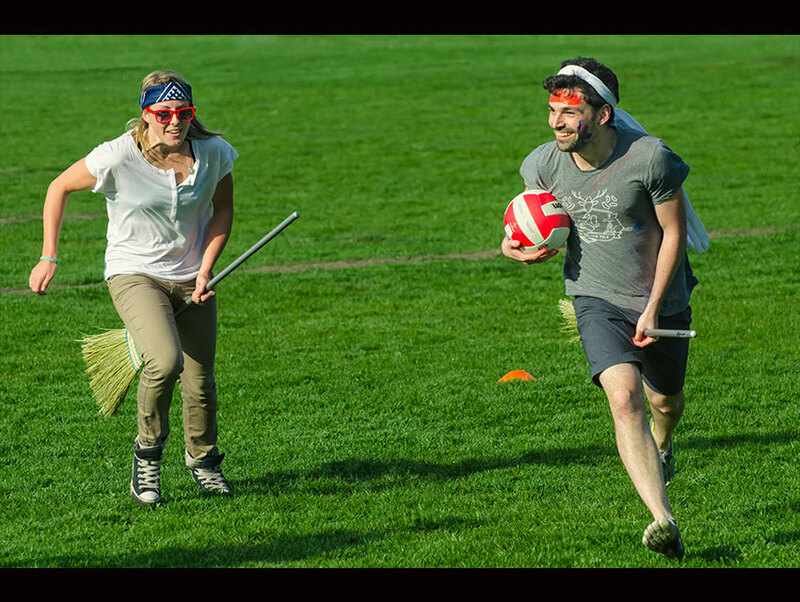 The big challenge of real world Quidditch is that it’s a one-handed sport. Participants must keep their brooms tucked between their legs and never let them touch the ground while they do everything else. The IQA rulebook specifies that every team must always field at least two players who identify as a different gender than at least two other players. This means that not only women but those who don’t abide by the gender binary are welcome in the sport. There’s a simplified form called “kidditch” that UCLA players teach to inner-city youth once a week. Whether or not you were aware of it, muggle Quidditch has been around for nearly ten years. It was first played at Middlebury College in Vermont in 2005—the year when kids who grew up reading the series would have started attending college. For most Americans, higher education probably resembled Hogwarts School of Witchcraft and Wizardry; they were away from home, living in dorms, and studying highly specialized subjects. A governing body, the IQA, soon formed, and it has presided over seven World Cups. The season depicted in Mudbloods led up to the fifth World Cup, which, despite the title, was the first time an international team (from Finland) participated.